Description This was a pleasant walk following the Icknield Way northeastwards through Cambridgeshire. Condition I feel relatively okay despite the length of today's walk, and have no significant problems to report. Weather Today started of bright and sunny, but as the day went on the clouds started to increasingly gather. It was also a warm day, and there was not much of a breeze to cool me off. It had been a late night last night as it was Sencan's birthday, and I treated Sencan and her sister to a night out in London. We had not got back until quite late, and my plans for doing a walk today rapidly went out the window. However this morning In woke up early, and as the sun was shining it seemed like an ideal day to go out for a walk. I therefore threw my kit together quickly and walked the half-mile to Shelford station ready to get an early train to do a walk that I had been planning to do for some months. A quick change in Cambridge was required, but I soon found myself getting off the train at Baldock station and walking down the steps to reach the road outside. As soon as my GPS had acquired enough satellites I set off through the town, which has been transformed now that the bypass has opened. What was often a chaotic and bustling scene was quiet, and the queues of traffic in the streets was much reduced, even taking into account the early hour. A shop provided me with sustenance, and as I drunk a can of Red Bull I headed up the road through the town. There are some attractive buildings around the place, and these added interest as I strolled along. By a roundabout there was a rather grand-looking Tescos supermarket that left me wondering what the building had been before the superstore had taken it over. Baldock was soon left behind, and a road and then a path led me uphill southeastwards out of the town. Near the top of the hill there was a footbridge that took the path over the new Baldock bypass, and from this there were some good views towards the twin tunnels that carry the road under Weston Hills. These tunnels are surprisingly attractive, and are hardly a massive blot on the landscape, and as time goes on I would guess that they will weather nicely. A little further on I was surprised to come across a bustling car boot sale, with seemingly hundreds of people walking around looking at various tables arranged around the place. It was an unexpected sight, and it was a relief to leave it behind as the paths took me onwards. The paths were all well cared for, and when they crossed fields a wide margin had been left to make progress easier for walkers, and it was much appreciated. Arrayed amongst the corn fields were purple-blue fields of lavender, and the contrast between the two colours were very pleasant. Just before Clothall was reached the path turned sharply to the left to head down the short distance towards the A507 road before climbing up Bird Hill. From the top of this hill came the first good views of the day, a narrow band of expansive views becoming visible to the north above the wide brow of the hill. At one point there was an old barn that was falling to pieces amongst an overgrown area, and by this time it was getting hotter as the sun shone down, and I applied a layer of suncream over my exposed skin. As the path went on the views became wider, but as the path descended towards Wallington these disappeared. George Orwell apparently lived in Wallington for some time and even ran the village sweet shop for some time, but the path did not pass his house as instead it left the road as soon as it entered the village and took a track that headed around to reach the church. A short distance away from this was a low, round structure built from brick in a grassed area to the right, and this turned out to contain the spring that traditionally gave the water supply for the village. A plaque said that it had never failed, and indeed there was water in it today. A fairly pedestrian walk took me on southeastwards towards the road at Redhill, the only problem being a plank bridge over a stream that was almost totally obscured by nettles and undergrowth, one of the few occasions on the Hertfordshire stretch of the path that it was not fully clear. From Redhill the road heads across fields towards Roe Green, where there was a sign denoting the route of the trail through the village. This was useful and a superb idea, although the signs were getting slightly faded - I wish other trails would do the same in areas of difficult routing through habitation. Sandon was soon reached across fields, and the pub marked on the map and mentioned in the guide book now appears to be a private home - another of the many country pubs that have closed in recent years. The path passed the church in Sandon, which has a stone tower supported by some heavily-weathered massive red-brick abutments that did not intrude on the scene too much. A road was joined for a few yards, but then a green lane, Park Lane took me southwards. This seemed to have been recently worked on, and in places some crushed stone had been laid down on the ground and rolled, the old material having been put to one side. The lack of vegetation on the piles showed that the work had been done recently, but the surface made for good going and I soon reached the road at the end of the lane. This road was followed for only a few yards before a footpath headed off towards a house, and then Notley Lane was joined. This was very much like the previous lane, and also seemed to be under restoration; a few yards along the lane there was a roller that was obviously being used to compact the stone. The overhanging trees kept the sun off me and it was therefore a cool walk, although after a while it started to be slightly boring. Another lane was joined that stared to take me in a more northerly direction, and a lone cyclist passed me before the path left the track and started heading across fields. The point where the path left the lane was not well marked and I nearly missed it, but I soon found myself on the short stretch of road that led into Therfield. The pub in Therfield was open and looked very tempting, and sitting on a bench outside was a woman who was painting a picture. We chatted for a few minutes about walking and the local area, but before long I dragged myself away and decided not to visit the pub - I would leave my rest break until I got to Royston. The path headed out of the village along a footpath that, once it crossed a plank bridge, was hard to find on the ground as it crossed a field - eventually I worked out that it was between an overgrown, scrubby area on the left and the corn on the right. A long track took me on, seemingly never-ending as it headed northeastwards. There were occasional signs waymarkers that showed the I was on the correct route, but as time went on I became increasingly convinced that I was on the wrong route. I felt better when I saw a waymarker by the gate that led onto Therfield Heath, but again as I descended I became convinced that I was going wrong - there was a building complex ahead of me that looked like the golf clubhouse marked on my map. I could not be bothered to climb back up to see where I had gone wrong, but fortunately by the time I reached the buildings I realised that I was on the correct path - the clubhouse was further to the east. There were a couple of inflatable castles near the buildings, and the area was bustling with people, a dramatic contrast to the quiet paths that I had been following for the last few hours. A short road walk took me into Royston, and as I walked through the town I decided to look for somewhere to stop. The first pub that I passed was closed for renovation, and I ignored another in the centre of the town as it seemed too nice for my muddy clothes. After passing the famous Royston cave I reached a roundabout near the church, and I realised that I had passed all of the pubs, so reluctantly I turned right and walked through the priory gardens to reach the centre of the town, where there were several pubs. One seemed particularly inviting, and I had a couple of pints of Abbot and one of orange and lemonade as I munched on some crisps. Eventually I had to go, and I was soon striding out back through the gardens which were busy in the sunshine to reach the route of the Icknield Way near to the attractive Royston Parish Church, which occupies the site of a Priory of Augustinian or Black Canons. 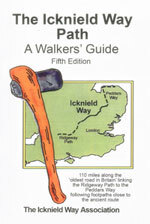 A long road walk eastwards followed, climbing slowly until just before the A505 was reached. When I had walked this way previously there had been a sign marking the Greenwich Meiridian, and it was shame to find that the plaque was missing, the concrete plinth having been damaged as if someone had wrenched the plaque off. Although the trail follows the A505 for a distance the walk is not too bad, as it headed through trees paralleling the road allowing only occasional glimpses of the road. After about a mile a lay-by by the A505 was reached, and a track took me on eastwards for a couple of miles. This was easy going albeit slightly hard on the feet, and the corn fields to my right were pleasant to look at as I strolled along, watching airplanes from Duxford pass overhead, including what I believed to be two Tornadoes flying in close formation as they turned above me to head back to the airfield. It certainly enlivened the walk, and as the trail left the track and started climbing southeastwards a biplane circled repeatedly overhead. The climb steepened into what was the stiffest climb of the day, before meeting the road in Heydon. This curved past the church, before another footpath took me on southeastwards. About fifty yards away on the edge of a field I could see a trig pillar, but my slowly increasing fatigue meant that I could not be bothered to divert off the path to go and visit it. Paths took me on across the Cambridgeshire / Essex border and on to meet a road in Chrishall. There was a bench near the village green that was tempting, but instead I strolled on, passing houses in a close before a footpath headed on towards some woods. Unlike the Hertfordshire stretches of the path this was hard to walk, the path beside a ditch being overgrown, forcing me into the recently harvested cornfield. Once the woodland was reached the path turned right, walking inside the trees until the southern edge of the woods was reached where it turned to the left inside the trees once more to join a road. This took me on towards the pretty little village of Elmdon. Opposite the church there was a pub, the Elmdon Dial, and I stopped here for another drink. There was some form of event on, and I went to sit outside as I drunk the orange and lemonade in the sunshine. It was a pleasant place for a stop, but after twenty minutes I decided to head on. As is often the case after taking my boots off my feet hurt for the first quarter of a mile, but they soon felt better than they had before the stop, and I joined the long tarmac track that headed eastwards towards Freewood Farm, passing a horse and rider on the way. Here I realised that I might be able to catch the 18.06 train from Great Chesterford if I hurried, and so I pushed my tired legs and feet harder as I walked along the track that ran beside some woodland from the farm. It was easy to follow but seemed to last an age, as is often the case when in a hurry, and it was a relief when the end of a road was reached in Strethall. The road passed an attractive and old cottage on the left, before heading left up an overgrown track that climbed up to reach Strethall Church. As I was in a hurry I did not bother to have a look around the church, and instead joined the road and sped up as I still strove to reach the station in time for the train. Although it had slowly clouded over as the day had progressed it was still quite warm, and to the east there was a combine harvester in a field, wreathed in dust from the dry ground and crops. After passing a crossroads a bridleway headed off to the right, and initially this was easy to follow as there was a wide band cut through the crops. I was slightly concerned about this stretch as it had been very overgrown when I had last walked along here years ago, and the footbridge over the M11 at the end of the path had been closed for repairs. I was therefore expecting it to be very overgrown, but it was not too bad until it started to head between two hedges, rising and falling with some occasionally dense undergrowth to make my way through. A particularly impenetrable stretch took me to the top of a slight hill, and ahead of me I could see the M11. By this stage there was no chance of my reaching the station in time for the train, so I slowed down as a very overgrown stretch of path headed down between the hedges towards the motorway. Nettles and brambles made the journey hard going, and by the time I reached the narrow bridge over the M11 I could see the train just pulling out of the station, seemingly close enough to touch. Depressed I strolled on as the path headed through one more short overgrown stretch before emerging out onto a lane near Smock Mill House. That soon turned to parallel the railway line. This was crossed by means of a level crossing with an adjacent low underbridge, and on the other side I was in the outskirts of Great Chesterford. I passed a bus stop that would have been ideal to get me home, but the last bus had gone half an hour before and so I walked to the station to wait for fifty minutes for the next train. The journey home was eventful; the train did not stop at my local station of Shelford and instead went straight through to Cambridge. I therefore had to take a taxi back to my home which cost ten pounds, but even this annoyance could not take the polish off what had been an extremely long but enjoyable walk. This makes a total distance of 26.7 miles, with 1578 feet of ascent and 1657 feet of descent. There are regular train services from Great Chesterford to Cambridge, where you can change for regular trains to Baldock via Royston. This is a walk which you can split into two at Royston if you so desire and there are also train services from there.